In 1949, Los Angeles was under the corrupt control of Mickey Cohen. As he plans to expand his influence across the west coast, a covert squad of LAPD officers team up to end his reign of terror once and for all. Gangster Squad – in UK cinemas 10th January 2013 - is a gangster film for a new generation, starring Ryan Gosling, Emma Stone, Josh Brolin and, as the iconic mob boss Mickey Cohen, Oscar-winning actor Sean Penn. Cinema’s fascination with the gangster genre spans almost a century and has allowed some of history’s greatest acting talent a pedestal to showcase their skills. To celebrate the release of Gangster Squad, we invite you on a journey through the greatest gangster performances ever. James Cagney’s loose-lipped, tight-fisted Tom Powers is the celebrated actor’s most ruthless screen incarnation. As Powers rises up through the gangster ranks, he becomes more brazen in what he is willing to do, and more obstinate and violent against those who either disagree with him or cross him. One of cinemas most iconic hard-men plays the role he was made for in Vince Stone, who will casually throw hot coffee in his girlfriend’s face and uses violence to hide his human inadequacies. A true sadist riddled with major character deficiencies all combine to create one of cinema’s greatest bad guys of all time. Ruthless criminal? Violent wannabe? Whistle-blower? Liotta will never top his sensational performance as real-life mafia gangster Henry Hill. The gangster had it all, but his growing paranoia reaches boiling point when he finds himself on the wrong side of his supposed friends. Christopher Walken shows his trademark eccentric style in creating the ultimate modern-day Robin Hood. The actor plays New York drug lord Frank White who, after being released from prison, becomes determined to wipe out the competition, yet instead of keeping the profits he distributes them to poor New Yorkers. Controversial director Abel Ferrara gave Walken free reign which allowed one of his best performances to date. A pint-sized, foul mouthed, out-of-control villain, Pesci’s real-life gangster Tommy DeVito is not one to mess with. It’s easy to laugh along with his insane antics on screen but audiences learn very quickly not to crack a smile at the man in person. Only Pesci and Ray Liotta knew about the famous “you think I’m funny?” scene when it was shot as legendary director Martin Scorsese wanted genuine reactions from the rest of the cast. Al Pacino stars as a man desperate for redemption after being released from prison. Slowly he reacts to the realisation that he can’t escape his past, and that it will cost him the woman he loves. Pacino’s portrayal of Carlito remains one of his most heartfelt and memorable to date. Robert DeNiro’s Noodles returns to New York after 30 years to find that the ghosts of his former gangster life still haunt the streets. His stellar performance is so effective in that he walks through each scene like an apparition, a shadow of the man he was, struggling to face his past. The perennial gangster, Al Pacino played Tony Montana as a wild, bordering on insane, violent criminal. Montana approaches the sunny Miami coastline like a destructive hurricane, leaving chaos in his wake. Unhinged and ferocious, he doesn’t think twice about wielding a chainsaw, but it’s the machine gun he lives and dies by. Marlon Brando knew how to draw a fine line between hero and criminal and with The Godfather he embodied the defining mafia crime boss - the yardstick every actor has aimed for since. Reportedly, Brando wanted Corleone to “look like a bulldog” so stuffed his cheeks with cotton wool to audition; director Francis Ford Coppola loved it and had a mouthpiece made by a dentist for filming. One of Hollywood’s most gifted actors, Sean Penn is well known for playing unsympathetic, cruel characters with depth. 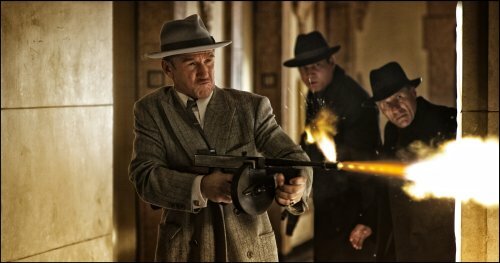 As renowned gangster Mickey Cohen, who ran Los Angeles with help from loyal goons, corrupt cops and paid politicians, Penn is at his violent best. Cohen at his core was a warrior, and he was not about to give up the West Coast to the LAPD without a fight.